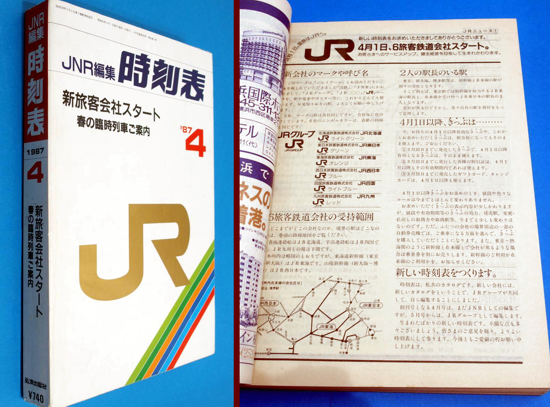 --- "Central Japan Railway Company"
Features: In 1987, the year of its foundation, the Central Japan Railway Company (JR Central, or JR Tokai in Japanese) was one of the following seven companies owned by the new Japan Railways Group. --- 3) East Japan Railway Company (JR East). --- 6) Hokkaido Railway Company (JR Hokkaido). --- 7) Freight Railway Company (JR Freight). 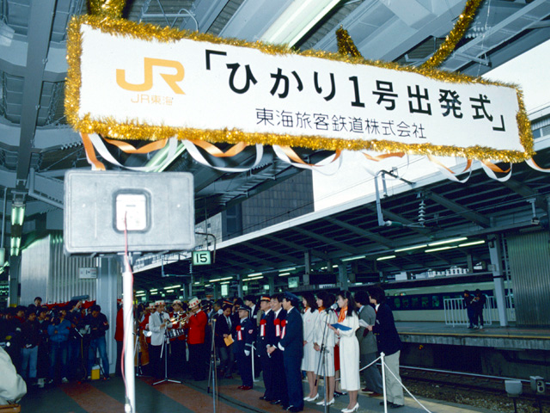 Interesting facts: Central Japan Railway Company began operating on April 1, 1987 upon the privatization and breakup of the Japanese National Railways (JNR), a state-controlled agency that maintained a near monopoly over all railway business in Japan since its inception in 1949. In 1987 the JNR had been dissolved, and in its place stood seven companies as described above. In the same year, a state agency that held all of the stock in the seven companies, the Japan National Railway Settlement Corporation (JNRSC), was also created. 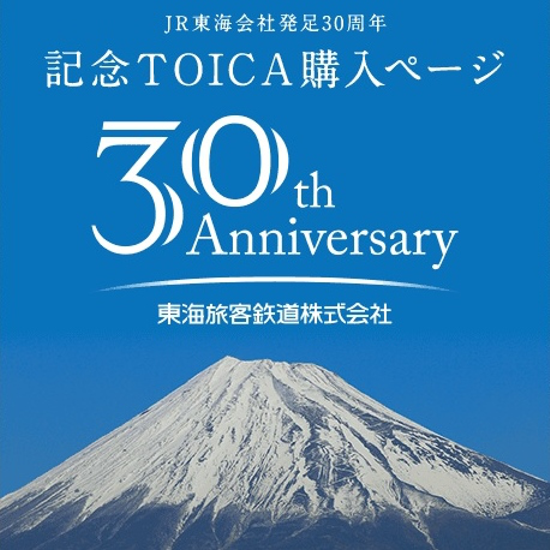 A year later, JR Tokai Bus Company was established, and automobile transport business was also transferred to the company. - 12 conventional lines centered on the Nagoya and Shizuoka City areas. 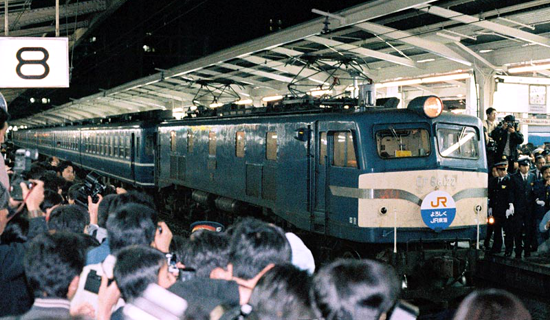 Japanese National Railway stops operations (Tokyo, March 31, 1987). 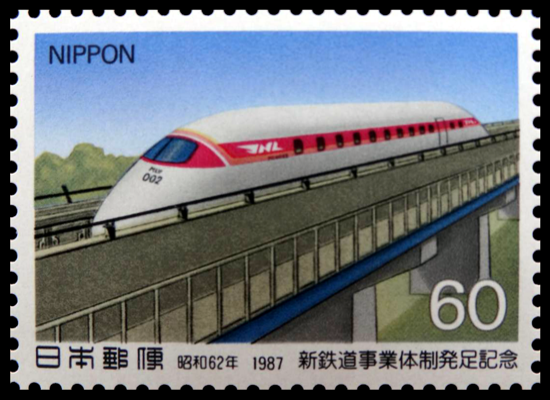 Special free one-day tickets for all Japanese lines were issued on March 31, 1987. 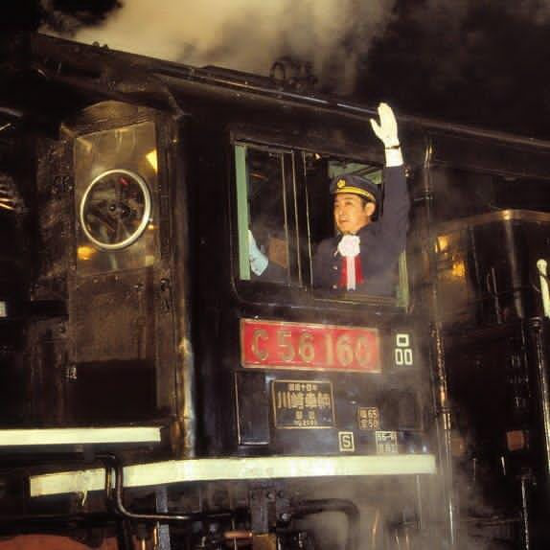 In a public ceremony at midnight, Takaya Sugiura - the last president of the Japanese National Railways (JNR) - rode a "C-56160" steam locomotive at Shiodome Freight Terminal in Minato, Tokyo, and blew the whistle to mark the end of the 115-year-old national railways. 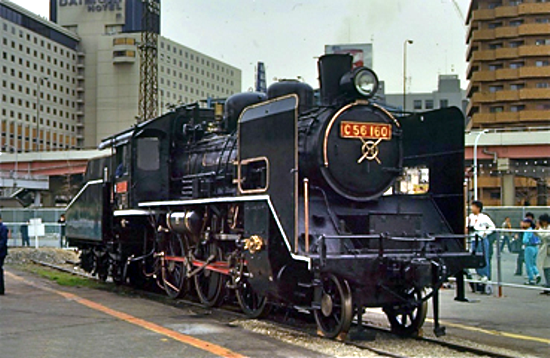 Locomotive "C-56160", built by the Japanese Government Railways (JGR) from 1935 to 1939, and later operated by Japanese National Railways (JNR), is preserved in operating condition by JR West at Umekoji Steam Locomotive Museum. 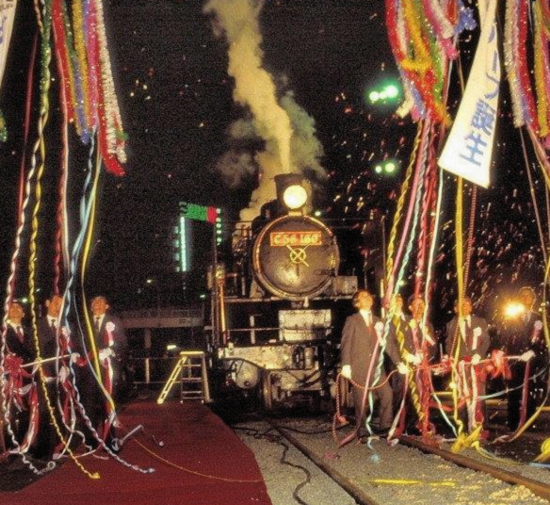 Central Japan Railway Company starts operations (Tokyo, April 1, 1987). 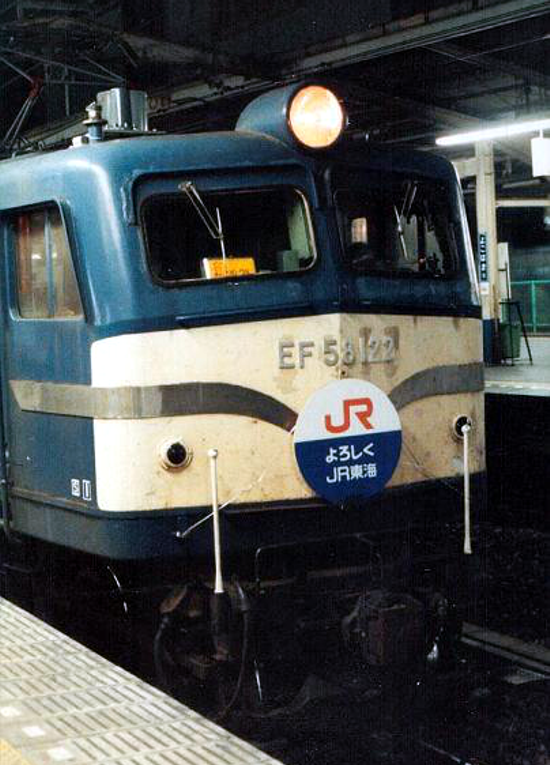 On March 31, 1987 at 11 pm, the first JR Central train "EF 58-122" left for the maiden voyage from Tokyo Station to Nagoya Station, where it arrived the next day at 7.27 am. On a head mark, the new orange "JR" logo and "Best regards JR Tokai". Locomotive "EF 58-122" was built in 1957 by Hitachi, and cut up at Hamamatsu Works in January 2009. 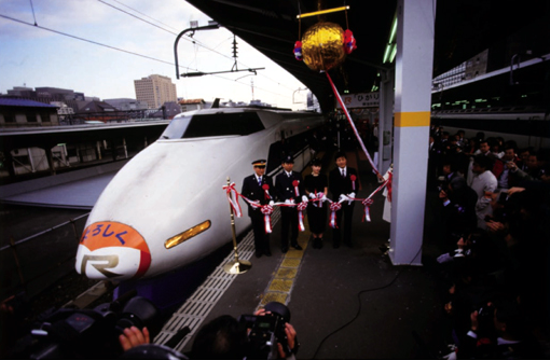 Central Japan Railway Company starts to operate the Tokaido Shinkansen high-speed line (Tokyo, April 1, 1987). A so-called "bullet train" Shinkansen 100 series left from Tokyo Station showing the new company brand at the head mark. 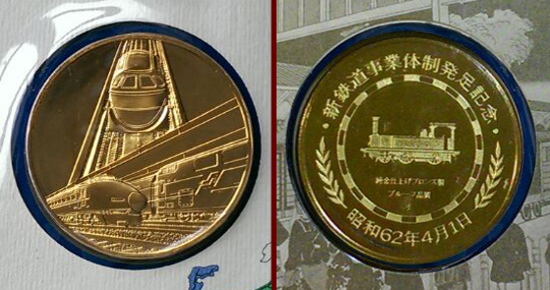 Japan Railway medal and postage stamps (April 1, 1987) issued to commemorate the establishment of the new railway business system from public corporation (JNR) to private enterprise (JR). 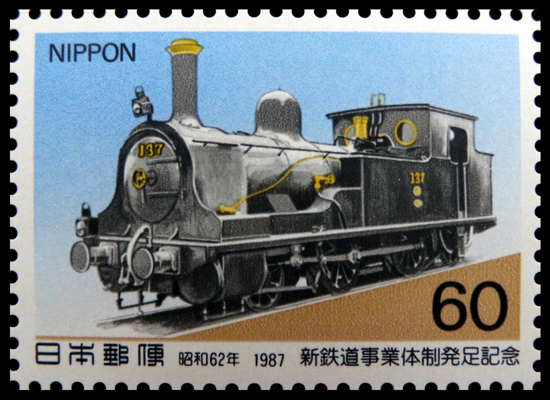 The two depicted trains are: the first ever steam locomotive built in Japan, "No. 137" (originally "No. 221") completed in 1893 by JNR / IGR Kobe Works, and the prototype "Maglev MLU002" (Magnetic Levitation, U-shaped guideway) built in 1987 by JR Central for experimental purposes only. 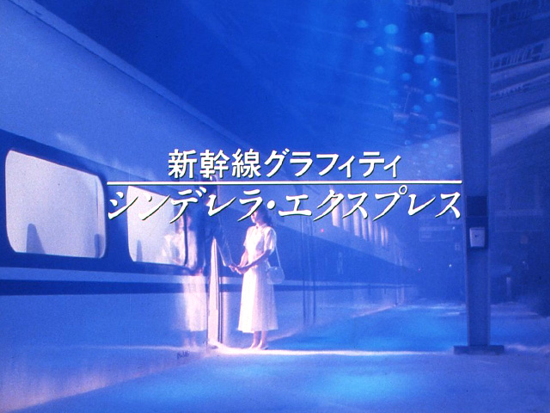 Central Japan Railway Company, first TV commercial (June 1987). To promote the Shinkansen high-speed line, the "Cinderella Express" campaign began, targeting young people by depicting a situation in which a couple share a long-distance relationship. Title and background music: from a song by Yumi Matsutoya; actress: Misa Kawai.